In the Housekeeping X Games, Daisy's favorite event is Extreme Dishwasher Cross, a sport characterized by intense verticality and dangerous stacking. What a sweet picture--my four-year-old son was just doing the same thing this morning. He's been unloading the silverware rack for quite some time and handing me the dishes for me to put away but today I thought he might be ready for the full job. He uses the same standing-on-the-counter method that Daisy employs. Complexity added by the fact that she is wearing tights. I wondered what she was getting up to these days. And now I know. Yikes. Oh my word! That is just too precious! This made me laugh; it's the same thing I have to do when I unload the dishwasher. What a helper! My son is not an at her pro level yet; he's an amateur, but his sport is "moving dining chair to kitchen and *helping* to cook eggs/soup/anything." He can somehow manhandle that chair to the counter in about 3.1 seconds flat. It's really an extreme sport. She's brave! I still do this, to clean the tops of the cabinets. And I'm 6' tall! I love her tights. I must not let my Ginny see this picture! She just continues to be so sweet and charming! Beautiful Picture! Isn't it wonderful how eager children are to help mommy at that age : ) My boys love unloading the dishwasher for me! Such helpers they are!!! I found your blog through Home and Harmony. What beautiful pictures paired with meaningful words. IT's so good to see so many christian women stating so much about their faith. Glad to join here. My little sister is learning to do that. Very cute picture. That is too precious!!! Thanks for making me smile Anna! Have a blessed day in the Lord! Sweet! This is exactly what my 7 year old does! Love it! I've been known to use countertops myself. 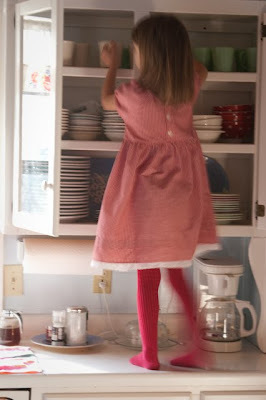 At least Daisy will probably grow tall enough to get into the upper cabinets without a stool!